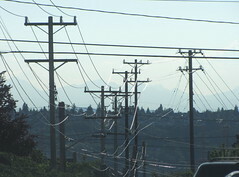 These are the new power lines on the west side of Beacon Hill. Photo by Wendi. The Seattle Times revisited the power line controversy on northwest Beacon Hill today, including a photo of neighbors Heather DeRosier, Carole Swanson, and Joan Habu standing underneath one of the new poles with a “Take Them Down!” protest sign. The new, thicker power lines, with taller poles, were installed a few weeks ago near South Stevens Street and 12th Avenue South. Thank you for your note about the electrical service upgrade in Beacon Hill. Seattle City Light installed an additional set of power lines to provide service for Sound Transit’s light rail trains, electrified buses and growing energy needs in the Rainier valley. The utility spent about three years reviewing possible routes and designs to deliver this needed service upgrade. While we try to limit the impact of such projects on the surrounding neighborhoods, safety for residents and our workers, reliability of the electric supply, and cost are important considerations as well. Poles march down South Stevens Street. Photo by Wendi. On this project, adding additional power lines required poles that could handle more weight and stand up to more wind than the poles that had been used before. Working with Sound Transit, City Light determined that the middle of the hillside could not support such a pole. Additionally, the original pole had been located in an area that had no road access. Any maintenance work required crews to hike the hill, carrying any tools and supplies to the site. Such circumstances increase the risk of injury to our workers and make it more difficult to complete repairs. Without the ability to place a mid-hill pole, the poles at the top and bottom of the hill needed to be taller in order to maintain the minimum wire clearance necessary for safety. Our engineers considered running the lines through the bus tunnel. That option was determined to be unworkable. City Light crews would have limited access to the tunnel for maintenance and repairs. 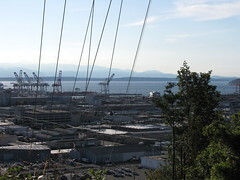 City Light’s alternating current power lines also would have been located near Sound Transit’s direct current lines, creating a safety issue for any maintenance work. Finally, this approach would have added more than $1 million to the cost of the project. Our engineeers also considered placing these lines underground. To do so would have required directional drilling or boring small tunnels (microtunneling) down the slope. A soil engineering study found a significant risk that such tunnels could collapse during the boring. Even if such an effort was successful, it would have added at least $1 million to the project for directional drilling and $5 million or more for microtunneling. City Light and Sound Transit recognize that the community notification about this project and its impact on Beacon Hill residents could have been better. We have taken steps to improve our processes for identifying potential neighborhood impacts of the work we do and sharing information with community members earlier in the process. We would welcome the opportunity to meet with you and your neighbors to discuss this project further. I sent an invitation via email this morning to Jorge Carrasco, City Light, asking him to join us at the October 1 North Beacon Hill Council meeting. Please mark the date on your calendars. Let’s all make a special effort to invite our neighbors on or near 12th Ave. I’ll post Carrasco’s response as soon as I hear back. Thank you for being the only news site to post both sides of the story, instead of the standard issue Seattle Times anti-progress FUD. As far as I know they did not do an impact study concerning these lines. It is possible to make the city do one thus shutting down and even removing the wires until a full study is done. This comes by way of credible friend that is familiar with what has transpired there. What a remarkably stupid idea. Take down a transmission line for the sake of a handful of whiners, and use environmental reasons as the excuse? Your “credible friend” obviously has no idea of what he/she is talking about, which means that they are either an attorney looking for a commission, or a city hall staffer. Either way, good luck with your dumb idea. Do you want effective transportation, or do you want to preserve a view for some spoiled homeowners? Puh-leaze you are the idiot that obviously does not live, know, or understand how these home owners have a right to voice what has happened, being many involved were deceived in the original agreement of said new transportation plans and development. Hence, keep your ignorant opinions to yourself instead of voicing your stupidity. Owners have the right to what they pay for and when an agreement is altered after the fact, they have the right to protect AND preserve their value AND view. You call them spoiled thus meaning you are one without a hard work ethic to know that when you work for 50 years to EARN what you have you thus are an idiot!